(CNN) -- Iran stands at a crossroads between the opposition movement and the Islamic regime, which has cracked down on protesters who dispute the election results that gave President Mahmoud Ahmadinejad a second term. 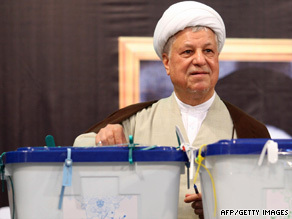 Iran's former President Ali Akbar Hashemi Rafsanjani votes in the presidential election on June 12. Some analysts say that Iran's former President Ali Akbar Hashemi Rafsanjani could play a key role in resolving the political crisis. Rafsanjani supported opposition candidate Mir Hossein Moussavi's bid to unseat Ahmadinejad -- but has been largely silent since the results of the June 12 election sparked massive street demonstrations. "If you look at the background and temperament of Mr. Rafsanjani, you will see that this is a man who knows when to interfere, when to intervene," said Mohsen Milani, chairman of the department of government and international affairs at the University of South Florida. "I think he is waiting to see where the center of gravity is. I think he is trying to become a kingmaker, a bridge builder," he told CNN. Rafsanjani is chairman of the Assembly of Experts, which is responsible for appointing or removing the supreme leader. There have been widespread rumors that Rafsanjani has been in the Iranian city of Qom trying to rally a coalition of clerics and political figures against Supreme Leader Ayatollah Ali Khamenei, who fully supports Ahmadinejad. A source in Tehran who is familiar with hard-liner thinking told EurasiaNet that Khamenei and his supporters "are much more concerned about Rafsanjani than the mass movement on the streets." Last Friday, Khamenei defended Rafsanjani from charges of corruption made by Ahmadinejad during the presidential debate. However, he opened the door to corruption charges against Rafsanjani's relatives. A day after the supreme leader's speech, Rafsanjani's daughter, Faezeh Rafsanjani, and four other relatives were arrested in Tehran for "inciting and encouraging rioters," according to government-funded Press TV. His daughter was released a day later. Commentary: Is Iran's ruthless crackdown working? Rafsanjani, 75, is one of Iran's richest citizens. He was a political activist in the 1960s and 1970s, and was imprisoned several times under the U.S.-backed Shah. Rafsanjani became a close confident of Ayatollah Khomenei, who led the Islamic revolution which eventually overthrew the Shah's regime in 1979. After the revolution, Rafsanjani held the powerful role of speaker of Iran's parliament in the 1980s, and then went on to serve two terms as president from 1989 until 1997. He ran for president again in 2005 but lost in a second round of voting to Mahmoud Ahmadinejad. In his current position, Rafsanjani is the "one man who can have reconciliation between the opposition and Ayatollah Khamenei," Milani told CNN. "He occupies two very important institutions in the Islamic Republic, one designed to resolve constitutional conflict, and more importantly the [Assembly] of Experts for leadership which can in fact remove Ayatollah Khamenei and have a new replacement for him," Milani said. "When Ayatollah Khomeini died, it took the Assembly of Experts a few hours to decide who is going to replace him. And it is very important to remember that Ayatollah Hashemi Rafsanjani played a critical role in convincing the Assembly of Experts to appoint Ayatollah Khamenei as Iran's supreme leader." Now, the two are bitter foes and Rafsanjani seems to be weighing his next move. The protests may not result in an end to the Islamic regime, but the demonstrations and the bloody crackdown have resulted in divisions that some experts question whether the regime will be able to repair. "I am absolutely convinced that what we are witnessing is a turning point in the history of the Islamic republic," according to Hamid Dabashi, a professor of Iranian studies at Columbia University in New York City. "Even if the Islamic republic survives this crisis, it will no longer be as it used to be."